Update at 5:35 p.m. — Treacherous conditions have been reported on local roads as steady snow continues to fall. Update at 4 p.m. — Fairfax County Public Schools will be closed Monday, the school system announced late Sunday afternoon. All Fairfax County public schools will be closed Mon. Jan. 14, 2019, due to the snow and hazardous travel conditions. School offices and central offices will open 2 hours late, to be opened by 10:00 a.m. (Cond 5) with an unscheduled leave policy in effect for 12-month employees. Earlier: Snow is still falling on Reston, which has seen more than 7 inches of accumulation in what is now the snowiest D.C. area storm since 2016. Another inch or two is possible before the storm winds down tonight, forecasters say. 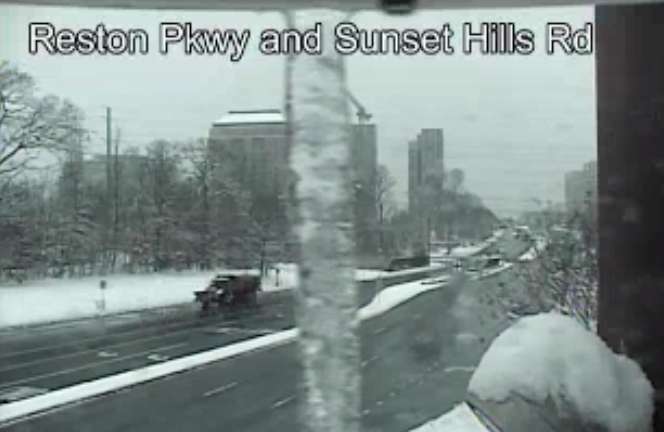 VDOT crews have been working hard to clear roads throughout Fairfax County, but officials are still urging residents to stay home due to slick conditions. Earlier this afternoon Virginia State Police said troopers in its Fairfax Division have responded to 34 crashes and 52 disabled vehicles since midnight. Statewide, more than 230 crashes were handled by VSP during that timeframe. As of 3:30 p.m. Sunday, Fairfax County Public Schools had not yet announced whether schools will be open Monday. Arlington and Alexandria, meanwhile, have both announced that schools will be closed tomorrow.